Recently declassified documents posted online by the Washington-based National Security Archive (NSA) revealed the full extent of US support for the 1964 ouster of Brazilian President Joao Goulart. 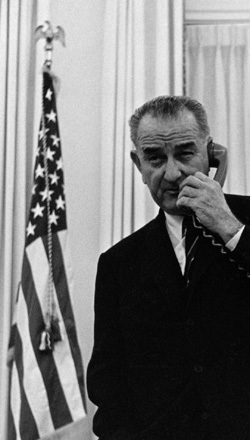 On a declassified audio tape, President Lyndon Johnson said "I think we ought to take every step that we can, be prepared to do everything that we need to do," in reference to preparations for the coup. Through the CIA, the US provided supplies and funding for the coup, and provided a naval task force to "intimidate Goulart's backers and be in position to intervene militarily if fighting became protracted," the NSA said in a news release. The support for the military coup was part of a broader program of anti-communist actions. According to the NSA's documents, Johnson feared Brazil becoming "the China of the 1960s." President Goulart was known to be friendly to labour unions, limited the profits multinational corporations could remove from Brazil, and had plans to trade with communist countries. High-ranking US officials had previously denied involvement in the coup. General Humberto de Alencar Castello Branco, who seized power in the coup, moved immediately to ban labour unions, round up and torture "suspected communists", and ban criticism of the government. Brazil's military government (which lasted until 1984) assisted General Jorge Rafael Videla in his successful Argentinian coup. In December 2003, the NSA posted declassified documents that demonstrated US involvement in the Argentinean "Dirty War" of the mid-1970s. Records show Henry Kissinger and other high-ranking US officials told the Argentine military junta to get the "dirty war" over with as quickly as possible, before US Congress could cut military aid. The NSA writes: "a post-junta truth commission found that the Argentine military had 'disappeared' at least 10,000 Argentines in the so-called 'dirty war' against 'subversion' and 'terrorists' between 1976 and 1983; human rights groups in Argentina put the number at closer to 30,000." » National Security Archive: Kissinger to Argentines on Dirty War: "The Quicker You Succeed the Better"